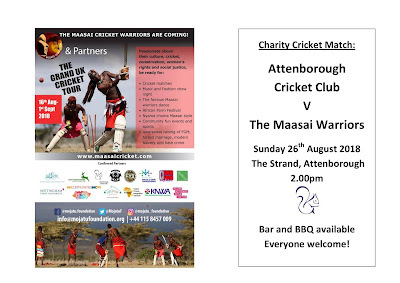 Attenborough Cricket Club: Charity Cricket match - The Maasai Warriors are coming! Charity Cricket match - The Maasai Warriors are coming! I am pleased to announce that on Sunday 26th August we are to play/host a charity cricket match against The Maasai Warriors, who are on tour in Nottinghamshire during August. This is a huge honour for Attenborough Cricket Club, to be involved in such a prestigious fixture. Last year the Maasai Warriors toured the UK and actually played at Lords! One of the purposes of their tour is to raise funds for worthwhile causes back home in Kenya, so I am sure we and the local community, will be able offer support in this regard.The Maasai Warriors play cricket in their national costume, with the addition of pads and helmets, so it should be quite a spectacle! Click on the advert below for more information, with further details being available soon.